UKSEE Admit Card 2019: The admit card will be released in the 4th week of May by Uttarakhand Technical University. The UKSEE admit card will be officially available on the website of UTU as well as here. The UKSEE 2019 admit card will be released separately for each course. Only those who have successfully submitted the UKSEE application form will be able to download the UKSEE hall ticket. To know about UKSEE admit card 2019 download procedure, releasing dates and details mentioned on admit card of UKSEE 2019, read the article below. All the candidates who have successfully submitted the UKSEE application form 2019 will be issued the admit card. The admit card will be released in the 4th week of may 2019. Candidates must carry the UKSEE admit card 2019 to the exam centre on the day of the exam. Without the UKSEE hall ticket 2019, no candidate will be allowed to take the exam. The UKSEE 2019 hall ticket will carry important information like the name, photograph, signature of the candidate, the course applied for, exam centre name and address, exam date and timings. Go to the official website of UTU i.e. http://uktech.ac.in/uksee/. It will redirect to the official website page. UKSEE Admit Card 2019 will appear on the screen. After downloading Admit Card, candidates must make sure to check if their UKSEE 2019 hall ticket has the below-mentioned details or not. Roll Number and registration number. Examination city and address of the venue. Photograph (uploaded at the time of application form filling). Candidates will be required to carry any one of the below listed documents along with the UKSEE Admit Card issued by the University. It is mandatory for all students appearing in UKSEE 2019 to carry both the documents. 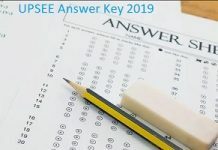 Candidates must check all the information present on UKSEE 2019 admit card carefully. In case of misspelling or any other error, the candidate must contact the concerned authority. The appearing student must enter the examination hall 15 minutes before the scheduled time. No entry will be allowed after commencement of examination. Candidates must preserve the UKSEE hall ticket till the admission procedure is over. Any request for change in the exam centre or category will not be entertained.